iON have announced the addition of a new sports camcorder to its range called the iON Action Pro. which has been designed to be specifically compatible with smart phone devices. Allowing you to control and record footage using specially designed applications on your smartphone. 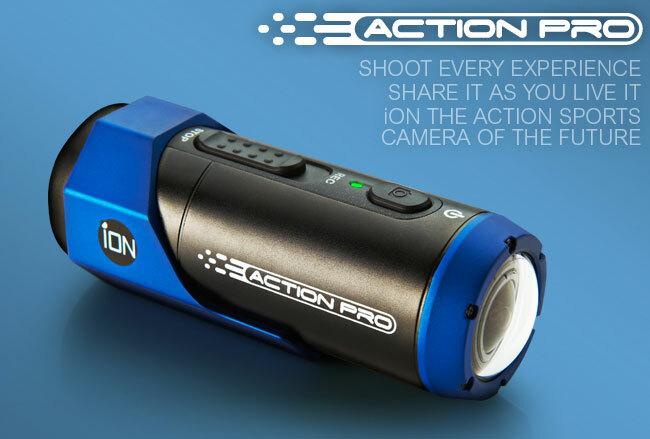 The iON Action Pro is the first Smart phone compatible action camera, says iON, that allows users to shoot HD video and share it in real time via popular social networking sites, such as YouTube and Facebook. The new iON Action Pro Camcorder is equipped with a powerful 1800 mAmp battery that will provide around 7 hours of juice on a single charge. The Action Pro lens has an angle of view of 170° ultra wide angle in 720p and WVGA 127° wide angle in 1080p, and can record at the following resolutions: 1080p: 1920×1080 pixels (16:9), 30 fps 720p: 1280×720 pixels (16:9), 60 fps. iON Action Pro also has a mounting system called the CamLOCK, which allows users to be able to mount their iON Action Pro to practically anything. Including helmets, mountain bikes, jet skis and motorbikes to name a few. The flexibility of the mounting system enables the camera to record video from all angles without the need for remounting. The iON Action Pro Camcorder is also waterproof and its Shoot And Share technology is supported by both iOS and Android devices. With footage recorded using H.264 compression, and saved as MPEG4 files. Its also comes supplied with 7GB of free Cloud storage.